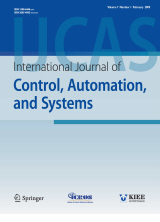 Abstract : "This paper studies the characteristic modeling problem for a class of single input single output (SISO) nonlinear systems with a relative degree of two. Firstly, to deal with the complexities of high-order nonlinear systems, we provide a class of low order and slowly time-varying linear systems to represent the original systems. Secondly, based on the characteristic model, we propose a linear controller by using coefficients obtained from system online identification. Through the above two steps, we solve the stabilization problem of closed-loop system composed of the characteristic model and the linear controller. Furthermore, the stability analysis of the closed-loop system composed of an exact discrete-time model and a linear controller is given. Finally, two simulation examples are given to show the effectiveness of the proposed design. " Keyword : Characteristic model, nonlinear system, sampled-data output feedback, stability.